The Religion of Peace is at work once again and this time the target of their whining “Victim Card” flashing is LEGO. 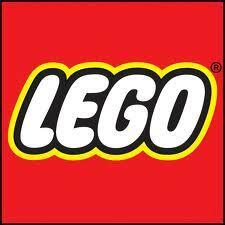 No I am not kidding at all – LEGO one of the world’s most famous family toys since 1932. Since 1932, and including me, millions of families have enjoyed this assembly set game founded, and still owned and operated by the “Kirk Kristiansen family in Denmark. How many hours have we spent as kids building Starships and houses based on our fantasies, or built fantasy worlds with nothing but hundreds of little assembly bricks and how much fun did we have, after watching a movie getting the assembly set and copy the set of changing it based on our fantasy. A fun game for the whole family, were kids are able to let their fantasy get the best of them. Exactly this family game is now the target of the Muslims in Europe as I have learned from “N-TV”; German “Spiegel Online”, and Austrian daily newspaper “Heute”. First I thought this of a bad joke but research on the website of the Turkish Cultural Society of Vienna proofs this is a true story. Well, I guess the Muslims had to take too much of criticism lately. Continues reports of OECD how they mistreat and torture and selectively banishing Christians, murder and slaughter them and the continuing bad News against Mursi and his Muslim Brotherhood gang of radical Islam Terrorists. So what they needed was a good distraction and what is better as distraction then once again playing the “Victim card of Discrimination”. And don’t forget we are talking about “Star Wars” here. 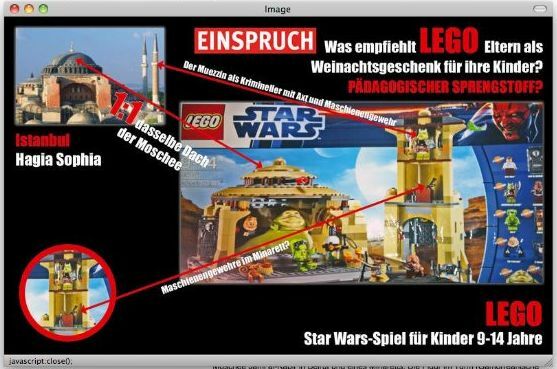 Honestly I really don’t understand the background of the story myself since I always thought Muslims don’t celebrate Christmas but according to newspapers a Viennese family father (not named or identified – guess why) was badly surprised when his sister placed this toy “Jabbas Palace” from Lego under the “Christmas Tree” for her nephew. Then again since when do Muslims celebrate Christmas??? The allegation is that the assembly set is to brim over with prejudice against Asians and Orientals. After taking a closer look the Turkish Cultural Society saw signs of “sedition”, called the Assembly set “pedagogical condemnable” (who is surprised – never let a chance to flash the victim card go waste) and placed a proper lawsuit. 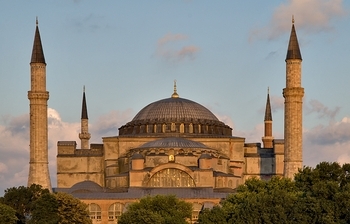 On a closer look Jabbas palace including the tower is alleging a 1:1 copy of the Hagia Sophia in Istanbul (Turkey) or the Mosque Jami al-Kabir in Beirut and one Minaret. The in the Hut living “terrorist” Jabba likes to smoke water pipes and kill his enemies, princess Leia’s cloth resembles a belly dancer and the fact that she is held on a chain shows how poorly Muslims treat the woman, and the guards look like Muezzins. Like they are not all that. Let’s face it: The Muslim faith is a un-humane, woman contemptuous religion of hatred and lies who support family violence, cutting off hands and heads, and killing infidels (who is everybody that is NOT a Muslim) and a lot more. But that has nothing to do with Star Wars and Jabba the Hut. That was a fantasy figure and George Lucas, a assured Liberal and goody-two-shoes surely had not Muslims in mind when he formed that figure in the late 70’s. The first reaction of the Lego Company in Denmark was a rejection of the allegation and pointing out that the toy set itself copies the original figure of George Lucas’ Star Wars. But don’t underestimate the power of Muslims in the left radical biased Media world. 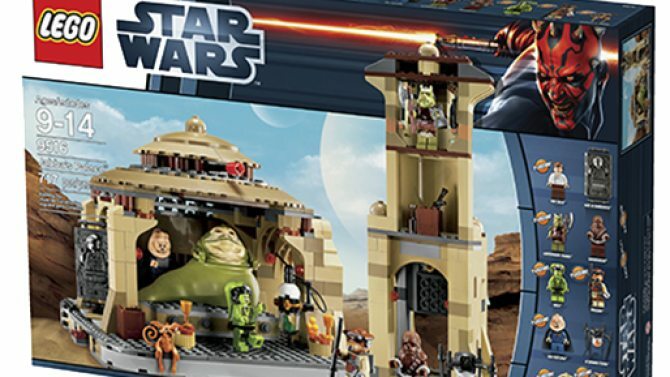 After dozens of international reports in Europe with finger pointing at Lego, the company now gives in to this stupid lawsuit and announced that they think about pulling Jabba’s palace of the market. On the first glance it means nothing for America. However, soon, if you look to buy Jabba’s palace in a toy store near you, you won’t be able to find one if the Turkish crybabies are successful with their law suit. And if you plan on visiting Legoland California or Legoland Florida don’t be surprised if Jabba disappears or worst the Hut does not look like the one in the movie anymore. Should the Turkish Society get its way with this lawsuit, Lego has to remove it all over the world or there will be a Law Suit near you and the truth of the matter is, in Austria a lawsuit results in a couple of hundred Dollars in America this can be costly for Lego and go into the Millions. Welcome to another Muslim distraction of their violent truth and facts by flashing the ridiculous victim card.